TUNE TONIC BY EMILE GRIMSHAW. ARRANGED BY RON HINKLE. BMG. BACK ISSUE. AUTUMN 2018. Location: /BMG Magazine/BMG. BACK ISSUE. AUTUMN 2018. Throughout our early years we are under constant pressure to succeed; to pass exams, to be picked for the sports team and to achieve good school grades. This pressure to prove ourselves in everything we do can spill over into our leisure activities. We constantly hear from our readers that they won’t play their instruments for others because they are not good enough—and they are scared that people will laugh at them if they make mistakes. This is a crying shame. Music is not a competition—it’s a source of joy for those who play and those who listen. Your friends will forgive your mistakes, and in many cases probably won’t even notice them! It doesn’t matter that you are not the best, only that you are the best you can be. Golfers claim that they never really play against others, but instead against the course and themselves. They strive to improve and be the best they can be. Take a step back and remember why you started to play an instrument and remember the times when you achieved that elusive run of notes, that arpeggio, that impossible-to-finger chord and the joy it brought you. Think about how you played when you first started and how you play now, realising the immense progress that you have made. Music is a wonderful escape—a chance to relax into something magical that you can create in the moment. 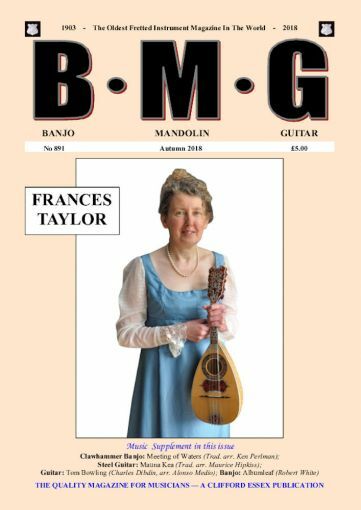 Forget what others think and take out your banjo, mandolin, guitar, ukulele or one-string fiddle and give yourself and your friends a treat. And above all, enjoy it! LIGHT GAUGE. 9 - 20. WOUND 3RD & 4TH. TENOR BANJO. CGDA. HEAVY GAUGE. NICKEL OR PHOSPHOR ROUND WOUND SET. 11 - 32.